Last man standing or riding also wins! German Markus Eichler performed admirably by staying in contention for the numero nera. 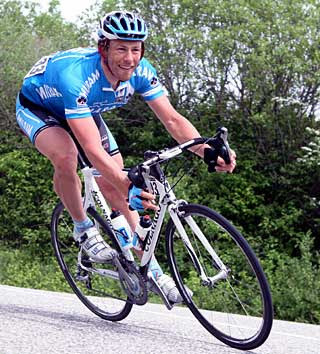 My money was on Italian Ermanno Capelli(Saunier Duval) but he abandoned on last Sunday's stage. As soon as Capelli left, Eichler took over as numero nera and never looked ... forward. To honor the last man of the race, the bike number on a black back was used. The 26 year old Eichler(Milram) held onto that numero nera right until the end. 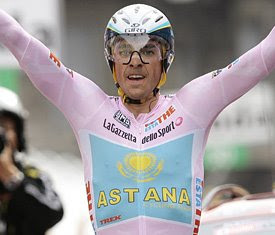 On the grueling stage 20, over the Passo di Gavia, he was dead last. A good sign for the numero nera. Alberto Contador may've won the alccolades that go with it but Markus Eichler is something else to via for last without dropping out! There's no cash offered for the numero nera but the young German rider was happy for the rare distinction. Which goes to prove that you don't have to be first to win. Move over Signor Contador, Herr Eichler has one up from you. He's the first to finish last! ... but Markus Eichler finished in an magnificent last!